Local bartenders are stone-cold serious about ice. Rocked-out rocks Custom ice spheres cool the spirits at Vessel. TINI BIGS HAS a rum-based cocktail, the Chet Baker, that is anchored by a massive, seemingly melt-proof ice block. When I asked bartender Jamie Boudreau how he’d made it, he refused to tell me, calling it a “proprietary secret.” If that seems excessive, consider this: Cameron Bogue, formerly of Vancouver, BC’s Lumière (where Boudreau once worked—the Northwest mixology milieu is nothing if not incestuous), reportedly won’t accept a job until a bar buys a Kold-Draft, a pricey ice maker that produces frozen cubes under pressure, locking out air and impurities. There are currently four Kold-Draft machines around Seattle: at Naga Cocktail Lounge in Bellevue, at Barrio and the new Tavern Law on Capitol Hill, and at Vessel, the downtown cocktail spot run by Jim Romdall. (His original boss there was Jamie Boudreau. See? Incestuous.) While Romdall may be more forthcoming about frozen water than his counterpart at Tini B.’s, he is just as serious. “When we stir a cocktail,” Romdall told me recently, all eye contact and staccato speech, the pedagogical habits of a seasoned bar-staff trainer, “it’s very important to get the right temperature and the proper dilution.” Things you cannot achieve by tossing in a few chunks from your average ice tray. Every 15 minutes the Kold-Draft cranks out 5 pounds of frigid hexahedrons, each 1.25 inches on all sides, and they emerge airless enough to melt slowly, preventing the watered-down effect you find in stirred mixers at less fastidious drinkeries. For cocktails they want to keep as cold as possible for the longest amount of time—mint juleps and mojitos, for instance—mixologists turn to crushed ice, which covers a greater surface area, to keep the overall temperature low. “We have a big ice crusher,” explained Romdall, “a beast of a thing that makes a very dry crushed ice, like really soft snow that doesn’t compact well. You can pick it up and it doesn’t get your hand wet.” The dryness cuts down on dilution, though crushed pieces will always melt faster than big blocks. Reaching into a heavy-bottomed rocks glass, Romdall picked out a globe about the size of a squash ball and held it up carefully between his thumb and index finger. 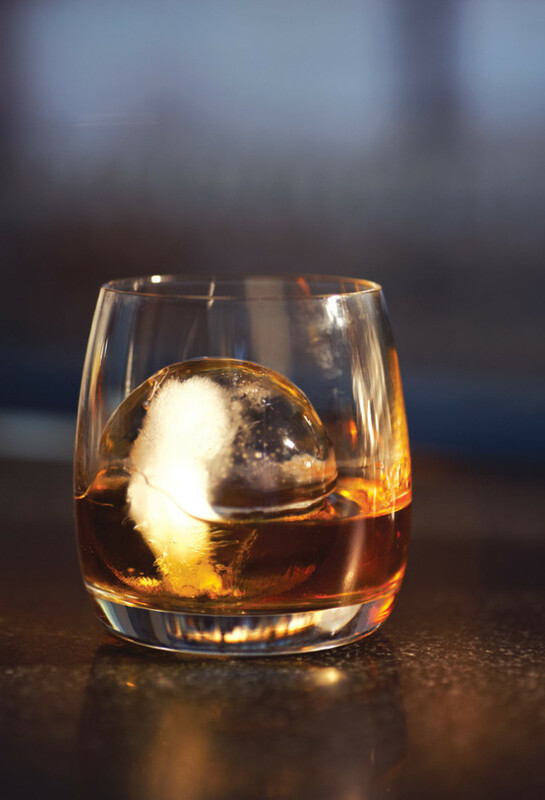 Behold the sphere: hallmark of serious spirits bars everywhere. Since Vessel opened in 2006, employees have made ice orbs with molds, but later, when Andrew Bohrer—who now freezes water over at Naga—worked there, he showed his then colleagues how to carve spheres individually using a Japanese technique. Large Tupperware containers are lined with Kold-Draft cubes, and double-boiled water is poured on top. The whole mess is then frozen to create a giant brick at which the bartender whittles away with a sharp knife, forming a big ball. Order aged spirits “on the rocks,” and Vessel will serve your booze with a sphere. It won’t keep your drink as cold as a cube, but it’s the best shape for slowing dilution over time. Plus, it looks cool.